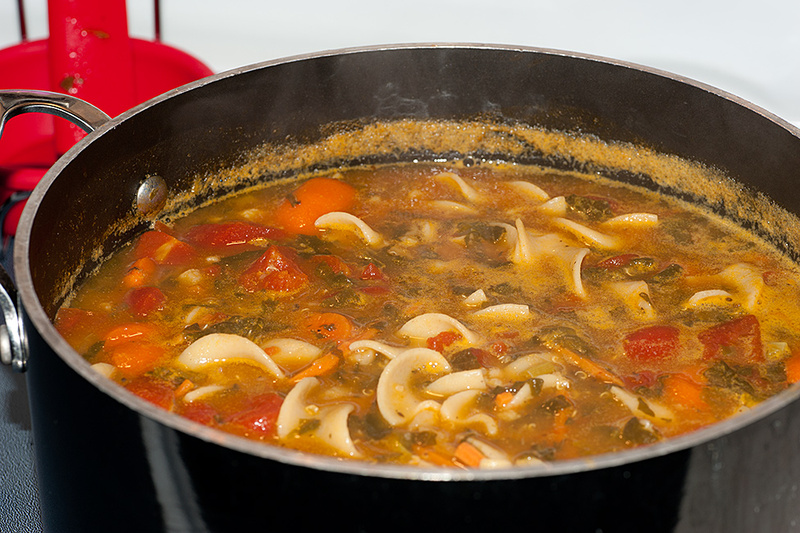 The other day dawned gray, miserable and cold here, and for us, this is the type of weather for homemade soup or stew. Our old family soup recipes are pretty involved, and the one that my grandmother used to make (Oxtail & Barley) calls for ingredients I just don't have, and can't always get. The barley I can get, but not all of the other stuff. One my mom's soups (one of our favourites) is also pretty involved and requires you to actually cook a chicken and make meat balls. Sounds intriguing huh? Well, it's a soup that's pretty similar to "Italian Wedding Soup", but so far none of the Italian restaurants that carry it make it the way my mom does. Many have spinach in it and although they're all very good, they just aren't mom's. Even Campbell's has one that's quite good, but not the same. Sorry, I probably got you all worked up for that recipe, but I'll do that later in the year. That's a soup we usually only get at Christmas, so it has it's own tradition attached to it. Today's soup is one of my own original recipes that has several variations - the first time I made it without quinoa and with diced asparagus stems (tender) instead of spinach. My husband, he's not a fan of spinach and usually turns his nose up at anything with spinach in it, but he eats this soup, and he likes it (a lot). The recipe and cooking is pretty simple - chop up all the veggies listed and toss them in the pot with the broth, then cook it all day. So lets start with the basic ingredients. 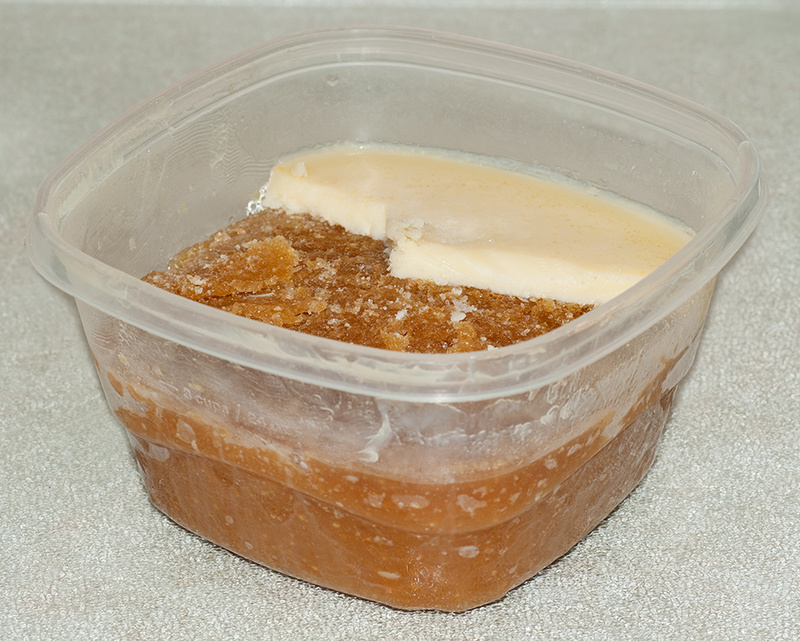 The broth I used this week was some I already had in the freezer. I'd prepared (through the summer) a roast chicken with a little bbq sauce, and saved the juice for future uses. I had 3 cups of chicken broth with a thick layer of fat on top. The beautiful thing about saving juice from roasted meats and then freezing it is the ease with which you can remove the fat. You can often take it off in one or two large pieces if you do it while it's still mostly frozen. Once the juice is in the pot, add 2 cups of water (more if you prefer a thin soup over a thick one). 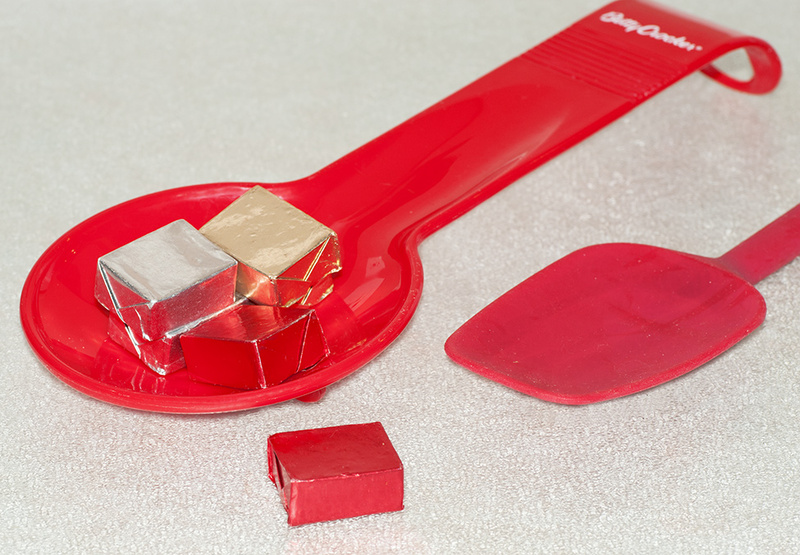 If you want a flavor boost, add a cube of natural stock flavouring (I prefer vegetable but you can use chicken or beef) - you can buy this at some bulk food stores and at health stores - don't use Oxo cubes, or Knorr cubes if you have a thing about additives. That's the stock part of the soup, almost. Open and add the box of frozen mashed squash and the tin of diced tomatoes (including the juice) and start the pot on medium-high. Chop the veggies (cauliflower florets, carrots, green onions, spinach) and toss into the pot. Rinse the quinoa well and cook on high for 5 minutes. It only needs to be partially cooked since it will continue cooking in the soup. Add that as well as the water to the pot. Add the uncooked noodles (I use whole wheat noodles made without egg yolks), and stir in the spices. Bring it all to a nice boil, then turn down to medium-low, cover and simmer for at least several hours. I don't usually put this soup in the crock pot, but in a regular stock pot on the stove, so I don't know how well it would fare in a crock pot. When serving the soup, sprinkle grated parmesan or romano on top (and if you don't like that, just leave it off). 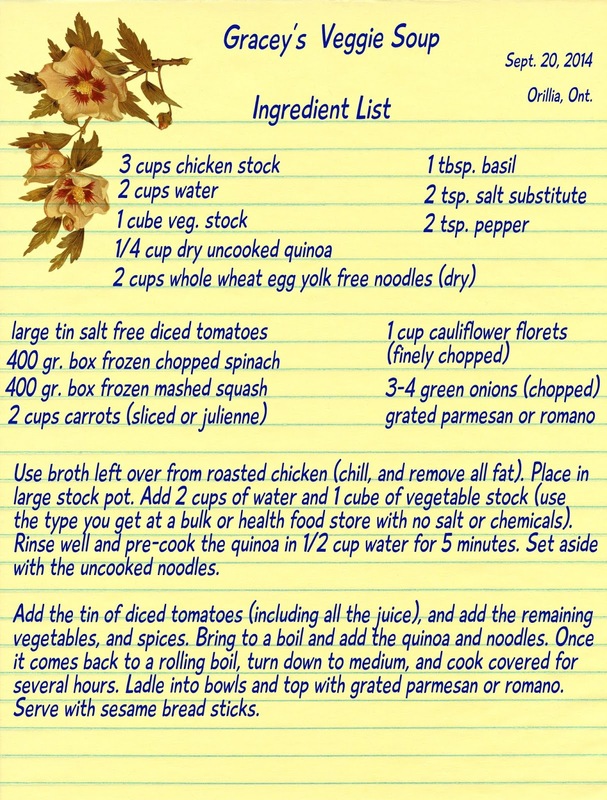 There are several things you can easily change in this recipe, particularly if you don't eat meat, or any meat products. Use all vegetable broth instead of a chicken stock. Add a cup full of mashed potato flakes to the broth when you don't use a meat based broth. 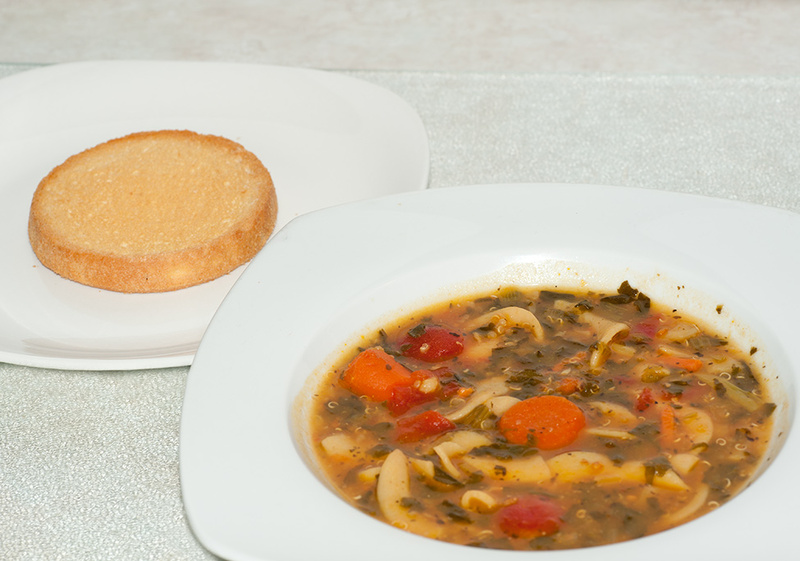 Homemade veggie soup & cheese bun. If you're a stickler for natural products, use them. I used frozen squash and spinach because I didn't feel like paying the cost for the fresh, but there's no reason you can't use fresh. If you have a problem with with gluten, make sure you replace the noodles with a corn-based gluten free noodle or pasta. I have used gluten-free elbow macaroni from Barilla instead, and it works fine. 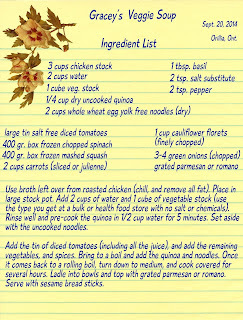 Or, eliminate the noodles altogether, and replace it with additional quinoa (so instead of 1/4 cup of uncooked quinoa use 1/2 or 2/3 of a cup). For non-meat eaters, quinoa provides a lot of protein. The only thing used to "thicken" this soup, is the mashed squash, and the uncooked noodles, there are no other additives. Homemade veggie soup and Dutch Rusk. If you have a family of carnivores, toss in some pre-cooked mini-meatballs. My grandson (one of them anyway) is a carnivore, and although he likes vegetable soups, he likes them a lot better when there is some kind of meat in it. I always keep some little meatballs handy, just in case. I like to serve this with sesame coated breadsticks, but my husband hates them. He likes "cheese sticks" - but these aren't cheese, they're soft bread in long narrow sticks baked with cheese (sort of like a skinny sub bun). This time around, I didn't have any sesame bread sticks, so I had mine with a rusk. I like those - 40 calories for one, and that's a lot less than a bun or piece of bread and because they're hard like thick, cold toast, they're perfect for "dipping" into the hot soup.